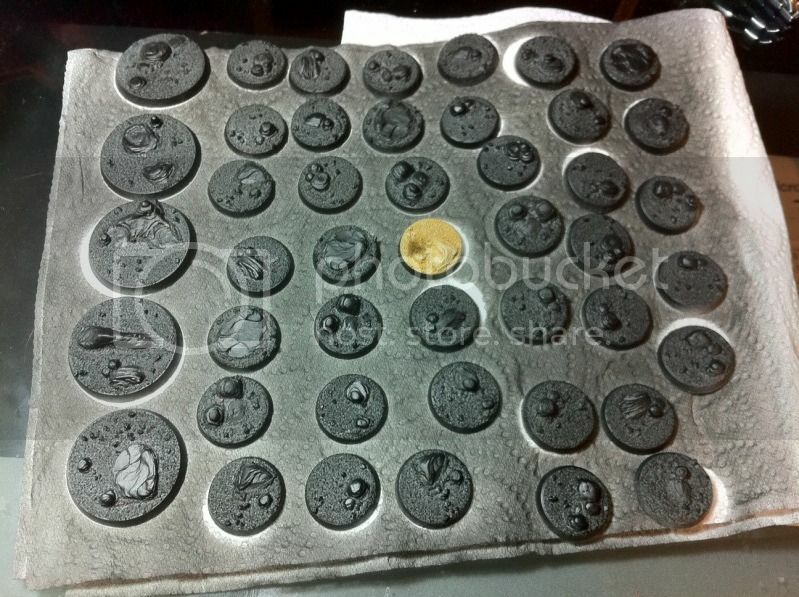 Got my shipment of resin desert bases in the mail the other day, all 45 of them (5 terminator bases, 40 stnadard size), and spent a lazy afternoon cutting off the excess flash and cleaning off the mold release stuff with a toothbrush and warm soapy water. 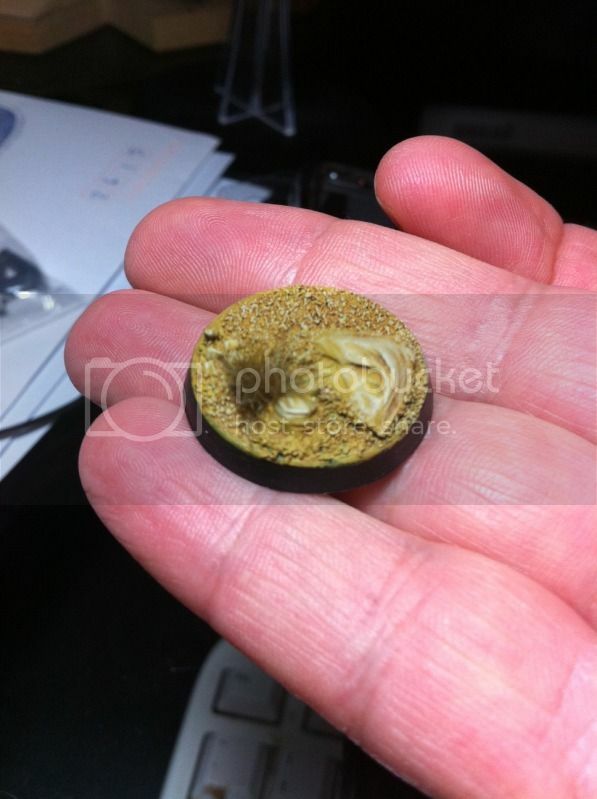 About ten of them were a bit rough, in that some lumps of resin were actually found down on the base edges, but this was rectified with a sharp blade and some light sanding, and once sorted out I hit them with some black undercoat. So with this new project i'm planning to only use "new" paint colours or those that are perfectly compatible with the older colours, but I still decided that a test scheme was in order. I took one base and layered on some Iyanden Darksun (foundation), followed with a Gryphonne Sepia wash, I then lightly brushed the Iyanden back on and finally a bleached bone drybrush. This was then finished with a glued on tuft of scorched brown static grass which I think works well. I was originally going to try finding a dark orange 'dead' static grass, but this looks more more pleasing and realistic. Still undecided on the colour for the base edges- I gave it a quick hit with black, but might change it to a dark brown instead?? Today's task is to hit up the local hobby shop for some 'new' versions of the colours above, paint up another base and compare them side by side. Im not expecting much difference, if any. So all I'm doing now is waiting for my Blood Angels to arrive from the states... not much longer now... I hope. Will be cool to have all the bases done and waiting for the minis, I think it'll help me focus on getting them painted up properly- painted minis on bare black bases looks acceptible, but unpainted/part painted minis on completed detailed resin bases would look a bit silly I reckon. One down, 44 to go.